Printmaker Deborah Cornell juxtaposes familiar images in unexpected ways to prompt viewers to reflect on big questions in science and culture. Her work explores ideas of reality and change, particularly regarding the interaction of science, technology and nature. Cornell created a series of prints entitled Species Boundaries that look at the consequences of genetic engineering and the unpredictability of genetic interactions over time. 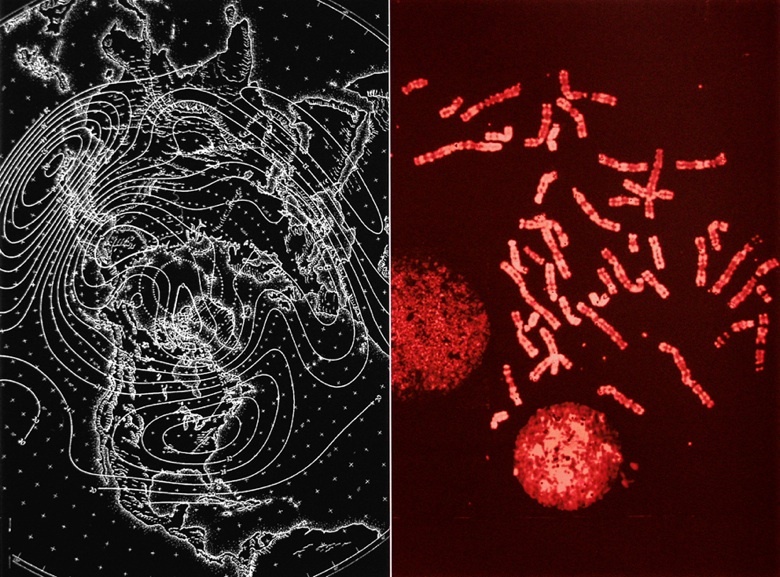 This print, Wind Map, uses the visual echo between a map of wind currents and a micrograph of chromosomes to raise make a point about complex systems and the illusion of control. No matter how hard scientists strive to control their experiments, genetic material is about as respectful of borders as the wind. You can see more of Cornell’s work at her website. This entry was posted in The Art of Science and tagged chromosomes, Deborah Cornell, dna, printmaking. Bookmark the permalink.